This post explains how to integrate SOAP web service with mobile applications using Xamarin. Most of the real world apps are based on data and this data resides in a database on your server. To access this data, we generally create web services and these web services can be then consumed by clients be it a 3rd party application or a mobile app. When it comes to writing web service, we can create either of REST Services, WCF Services or SOAP Services. This post explains how to integrate SOAP web service with mobile applications using Xamarin. The Xamarin mobile frameworks provide inbuilt support to consume standard SOAP 1.1 services over the HTTP application layer transport protocol. For this post, we have created a simple SOAP based ASP.NET web service (ASMX) with a simple Helloworld() function that returns the text “Hello world from WS”. 1. Right click the project and click “Add Web Reference”. 3. This is to be noted that as soon as the web reference is added, a reference to “System.Web.Services.dll” gets automatically added to the project. Once the proxy has been added to the project, you can use the proxy class to call methods from your web service. 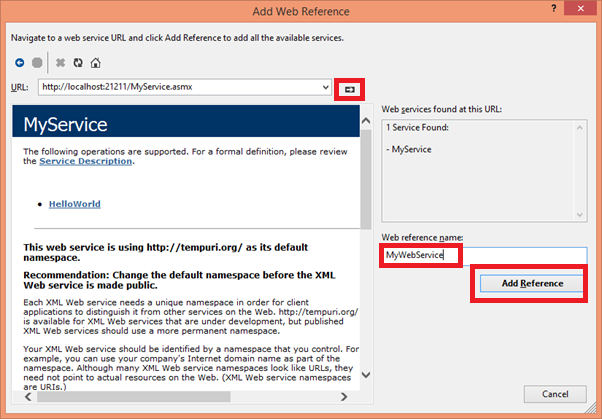 The reference name you entered in Step 2 above is translated into a namespace that holds all the classes defined by your web service. 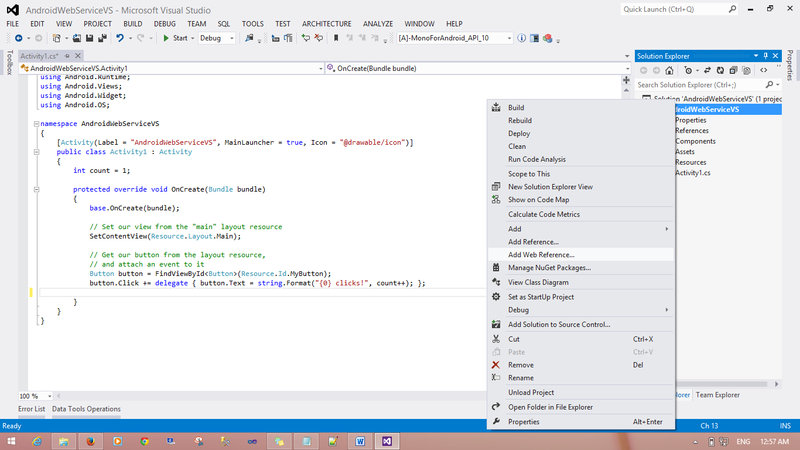 VS allows full intellisense support for your web service. Now, let us make calls to this web service from our android application. The 1st change that we’re doing is changing the text from the button with the data returned from the web service. 1. For this, we get the reference of the button in the Activity file and add a click handler to the button. 2. 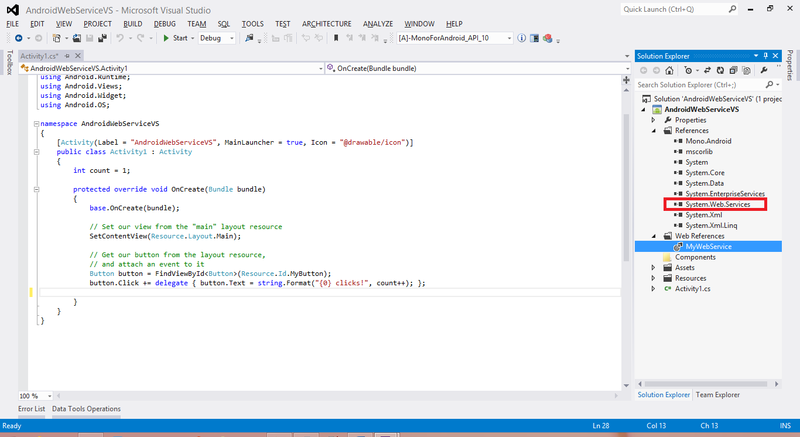 In the event handler, we create an object to our proxy class. 3. An important thing to note here is, if you are testing your app in Android emulator and your web service is hosted in localhost, the emulator will not be able to parse the localhost address. This is because it is loopback address to the emulator. To resolve this problem, we will need to set the URL of the proxy to http://10.0.2.2:PORTNUMBER/SERVICE.ASMX as shown below. If you’re not using localhost as your web service URL, you do not need to bother about this step and you can proceed to step 4. 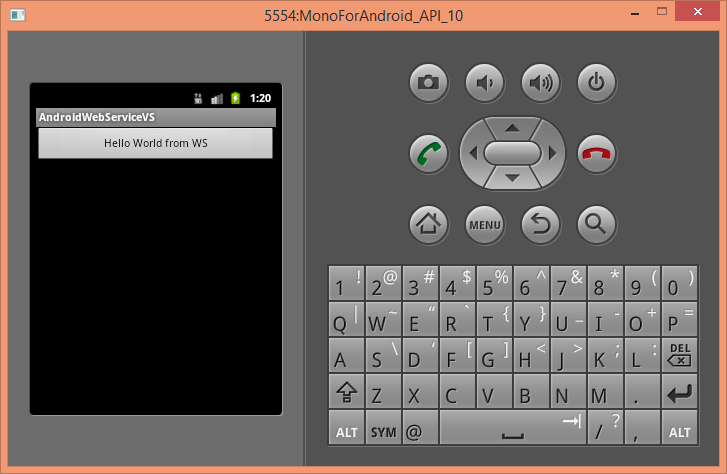 This is a very basic example of consuming web services from Android application. Hope you like this post. Cheers!